Do I Need To Use Plastic Wall Anchors For Wooden Wall Shelving? Question: I purchased IKEA shelves that weigh 4 lbs each. They are made of a wood like material. They came with 2 metal brackets that I attach to the wall and then mount the shelves to the bracket. Do I really need to put plastic anchors in the wall to hold them in place? I have some drywall screws I think will work fine. The maximum load on the shelves is 25 lbs. I will be putting a maximum of 7 lbs on each IKEA shelf. Do you think I need the plastic wall anchors or can I use long drywall screws? Please help. Answer: If you are going to be attaching the shelves into drywall you need plastic anchors (self drilling are best) not just the wood screws. 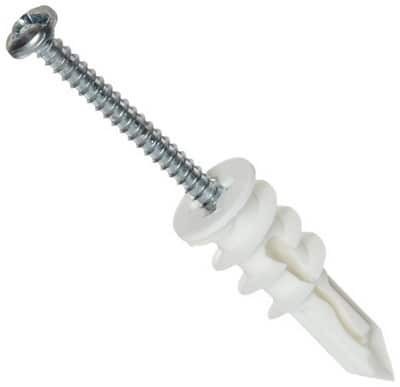 A drywall screw screwed into drywall will not hold the shelves for long. They will eventually fall out as the wood screw will become loose. Also, instead of the plastic wall anchors, you can get metal wall anchors that do not crack or split in half like the plastic anchors. Find exactly where you will be mounting the shelves. Use a level and mark with a pencil where the shelf will be attached horizontally. Find out where the brackets will need to be attached and measure accordingly. Draw a pencil mark where the brackets will attach so you know where to drill the hole for the wall anchors. Once you have the exact position of where to drill, drill the small hole for the wall anchor. Put the wall anchor in the hole and tap lightly with a hammer to get it flush with the wall. Mount the brackets by placing the over the wall anchor holes and then screw the screw into the wall anchor hole. Then mount the shelf to the bracket and you are done. The best option you have is to screw the shelving into the wood studs behind the drywall. You do not need plastic or metal wall anchors for this. You will first need to locate the wooden wall studs. 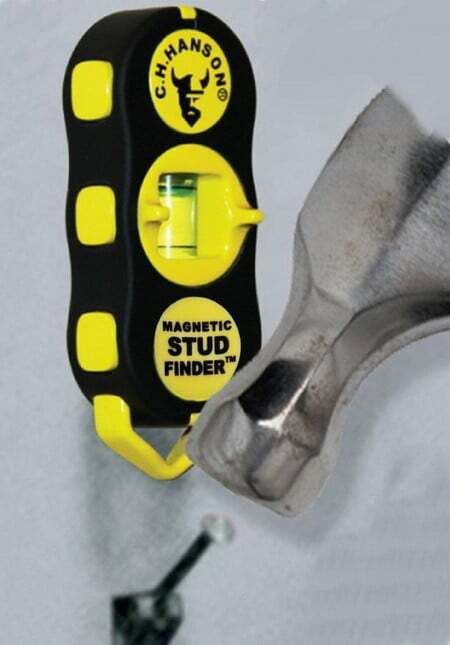 Use a stud finder to be able to locate the studs. They are usually 16″ apart from one another but varies depending on when your house was built. Once you locate and mark where the studs are, attach the shelf brackets with long drywall or wood screws. If you can’t get a stud finder then look for an electrical outlet on the same wall. The outlet box is attached to the wood studs on one side (either left or right obviously). To find out which side the outlet box is attached to you can remove the cover to the outlet. Look in with a flashlight to determine which side it is on. You will now know where the stud is located. NOTE: Drywall is usually 1/2″ thick. 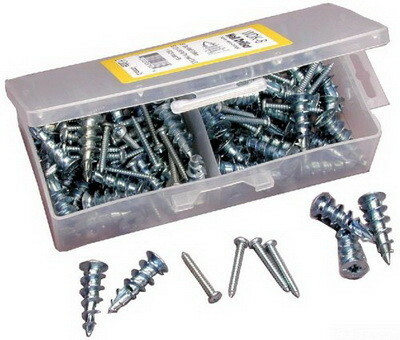 You will need screws that will go into the studs at least 1 inch plus the 1/2 inch thick drywall. 1 and 1/2 inch minimum screw length and the thickness of the bracket for the shelf. Do the math correctly so you have a long enough screw. 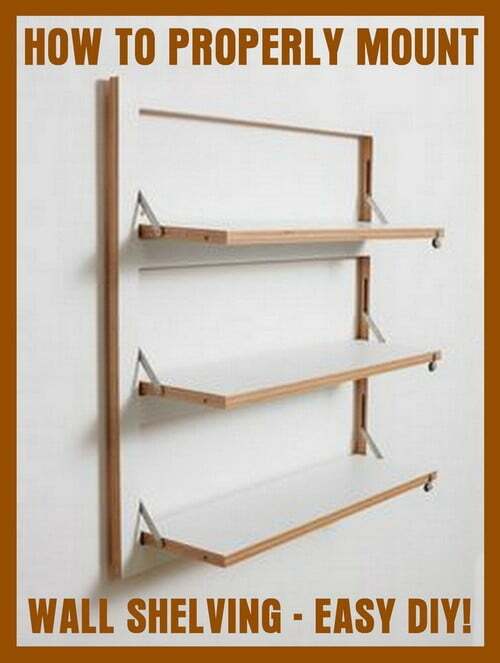 Do you know of a better way to hang shelving so it is secure even without using a stud? Please leave a comment below.